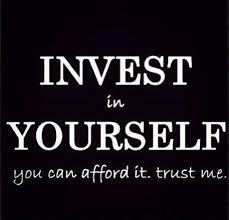 Investing in yourself is one of the best return on investments you can have. Whether it's investing in learning a new skill, developing yourself personally or professionally, tapping into your creativity or hiring a coach, you need to give to yourself first before you can give to others. It is our responsibility to take the time to develop our gifts and talents, so we can best serve others. Investing in yourself is an example of self-love, you must love yourself before you can expect others to love you. Why is investing in yourself so powerful? The value and potential that I possess, is important enough to me that I'm going to give it the energy, space and time to grow and create results. When you're willing to say yes, and take that leap of faith and invest in yourself, the universe will provide you with amazing rewards. I would like to share some incredible ways that you can invest in yourself - the great news is they don't all require money. 1. Set goals. Learn how to set personal and business goals for yourself. If you're not taking the time to set goals it's like driving in the dark with the headlights turned off. You will not know where you're going and you will waste precious time. Be sure to also set some time frames in which to meet them. Your goals should be SMART goals -Specific, Measurable, Attainable, Relevant and Timely. 2. Honor your intuition. You can show yourself love by trusting your gut and honoring the message that it's sending. Listening to your intuition, will allow you to make better decisions. Valuing your intuition, by not allowing the thoughts, feelings or statements of others to take away from what you know to be true is very empowering. By paying attention to how you feel, it will help you to make better, smarter and quicker decisions. I know for me personally, if I choose to ignore my gut or intuition when I feel a strong feeling about something, it almost always is a decision or action that I end up regretting. I have learned to always trust my intuition and that is what leads me in my life and business. 3. Invest time in your creativity. Our creativity doesn't have to diminish as we get older. In fact, it is believed that the peak of creativity in most people is around 30-40 years old. (Lindaur, 1998, Marisiske &Willis, 1998) Creativity can be the catalyst in the manifestation of continual learning and lifelong activity. It allows us to be inspired, have fun and appreciate the beauty in the world. 4. Invest in building your confidence. People who know their value, have something to say and others will listen. You can invest in yourself by developing an understanding of the value that you possess and offer others. Learn to have the courage to speak your truth. The more you love yourself and own the value that you offer, the more confident you will become in sharing it with others. 5. Read educational books. Books or audio books are an awesome resource to build your knowledge and expertise in any area. 6. Attend seminars and workshops to expand your knowledge and skills in your business and/or personal life. This will also give you the opportunity to meet and interact with individuals who are like-minded. a whole chapter in my book on health (Chapter 11) because of just how important it is to your success! 9. Work on your bucket list. If you don't have a bucket list, then it's time to start one. Your bucket list is meant to be a list of everything you want to achieve, do, see, feel and experience in your life. Your list may be ongoing, but you can start by writing 100 things down. Then each month or so, make sure you're knocking out at least, one of the items on your list. 10. Invest in a coach. A coach can assist you in putting all of these strategies into action. A coach is your partner in success. It is their job to assist you in creating and implementing your success plan, so you can become the best that you can be. I can promise this: When you invest in yourself, a world of opportunities will open up for you. And, if you have a business where you sell your services, you must know that no one will invest in you until you invest in yourself first. Investing in yourself emotionally, physically, spiritually and financially, will allow you to become the best version of yourself. When you are the best version of yourself, you will be an attraction magnet to others! Please share which of the 10 tips listed above you plan to implement this week...I would love to hear from you!